Good Morning and welcome friends! 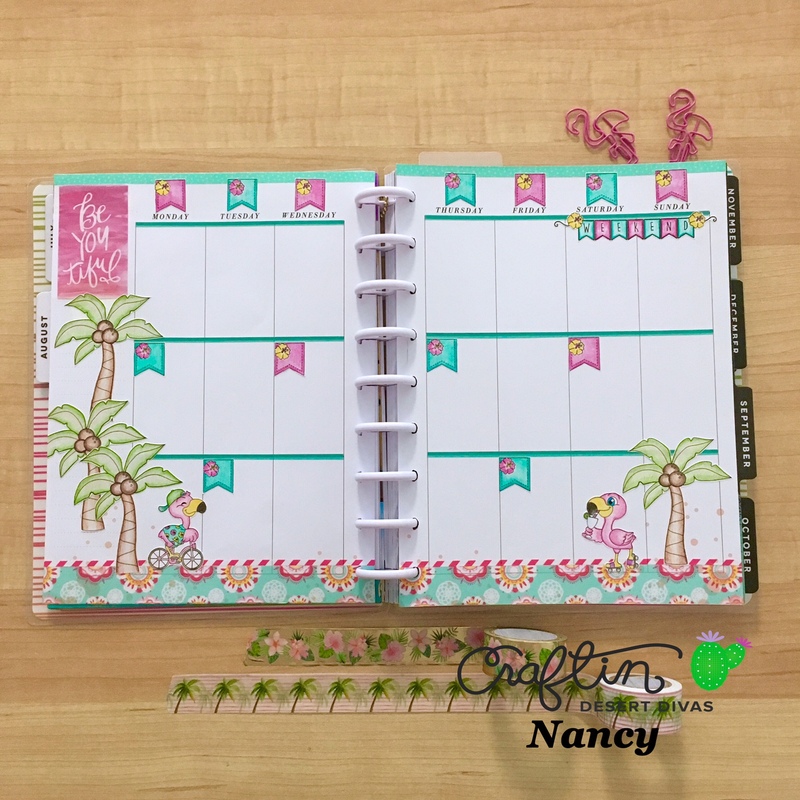 This is Nancy with the design team again, here to share with you another layout in my Happy Planner. I'm calling this layout Malibu Flamingo because it is inspired by beach front living. As I have never been to Malibu, but grew up in Florida this is my interpretation based on movies and television. 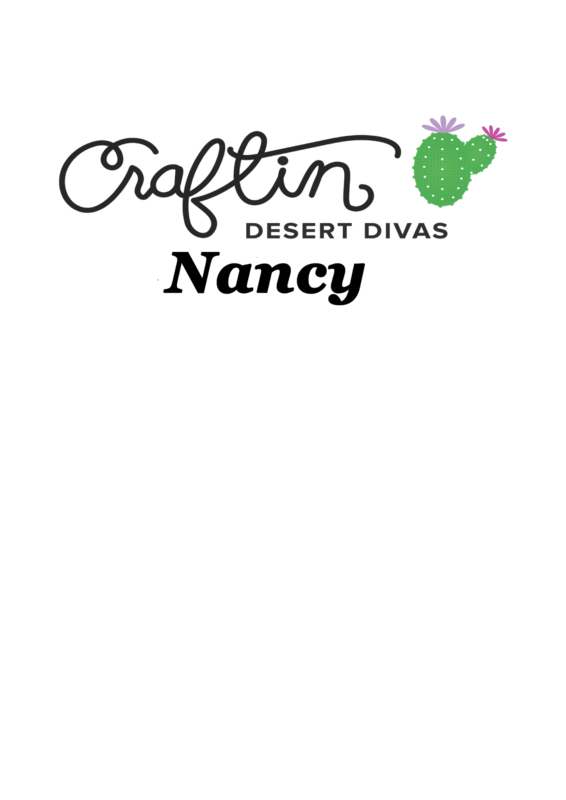 For this layout I am using products from the Carftin' Desert Divas August release and some of my favorite digital images. I love how physical stamps and digitals can work together seemlessly. Digital stamps are also a great way to bulk up your stamp collection. I have probably used the palm tree in this layout a dozen times or more in other layouts. I started with two of my favorite flamingos from the Tickled Pink stamp set as my focus. I love that they seem to be living it up on vacation somewhere. And of course, tropical birds would take a tropical vacation. The flamingo riding the bike is my favorite image in this set. Along with the rolling skating lady flamingo, they remind me of the opening credits of Three's Company. Now THAT is a memory from a long time ago!! If you have seen any of my other layouts or blog posts, you are probably aware that one of my favorite digital stamp sets is the Planner Basics Bundle. I use this set ALL the time. It is exactly what the name implies, basics for your planner. Because of this, you can use the images over and over and over. Today I have used some of the images that I don't use quite as often. I used the banner and the weekend banner image as I felt they helped convey my Malibu theme. I layered the banners with the small flower image from Tickled Pink to create my tropical banners. I also used the layered banners at the top of my page as date covers. Sometimes I work ahead in my planner and start layouts on weeks where I didn't intend for them to be. That was the case here. Luckily the banners cover the dates perfectly, and I can use this layout on the dates I had originally planned. As I am known to do, I created a bonus project for this layout. You may know that I love shakers (well, and flamingos) so a shaker bookmark was a given. I created the background using Distress Oxide Inks on regular cardstock and splattering with water. I cut a full sheet of cardstock in half to use one piece for the base of the shaker and the other for the top border. Using the Inside Scalloped Rectangle Dies, I cut two frames from the largest die. I knew I wanted to use this frame for the border on the shaker. But alas, the frames were not as large as my base piece. No problem. I just cut the frames apart and pieced them back together to make a frame that fit. I thought it would be funny if a flamingo who wanted to play ball on the beach was suddenly surprised by all the other ball playing flamingos and found herself under a shower of beach balls. So I stamped the beach ball and masked it into the arm of the ice cream eating flamingo. Then I stamped multiple beach balls to float around her. I added some coordinating glitter just for sparkle. I hope you enjoyed this project. As always, the products used will be listed below. If you have any questions, or want to say hi, comment below or reach out to me on Instagram at @nancy_finch. 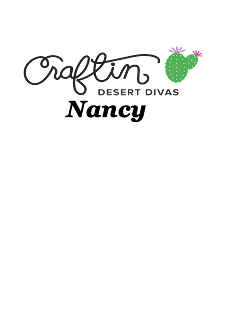 Happy Crafting and I will see you soon!! 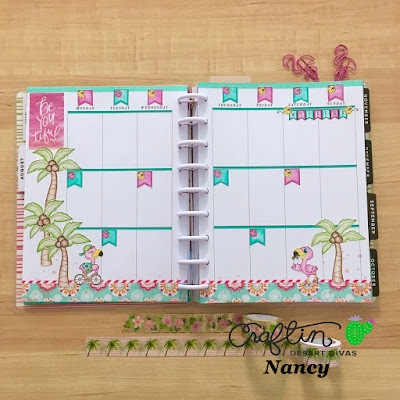 Super cute and fun planner layout, Nancy! I like your style and sense of fun and whimsy! Thanks for sharing. :) Have a happy day.